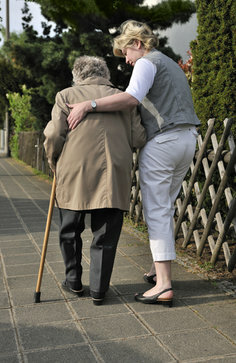 If a person becomes mentally or physically incapacitated to a point where they can no longer make rational decisions about their person or their finances, their loved ones may consider a guardianship or a conservatorship whereby a guardian would make decisions concerning the physical person of the disabled individual, and conservators make decisions about the finances. I recently met with a client who informed me that her daughter had financial power over her matters. ”You mean she has a power of attorney?” I inquired. After several more questions I discovered that her child was a joint account holder on mom’s checking and savings accounts. It is a startling, though not surprising, fact that an overwhelming number of people have absolutely no documents in place to direct where their assets and estate should go upon their death. Why? Currently, close to 5.3 million Americans suffer from Alzheimer’s. In the earliest stages of this illness it is difficult to impose upon your parent(s) the type of measures that will protect them wholly from financial scams or to remove their financial decision-making privileges. The desire to preserve your parent’s dignity and self-respect may make you decide to “stand down” in the beginning. They are your parents, after all. You don't want to take their cards or checkbooks away as though they were children. This desire to be kind and respectful can unfortunately have serious repercussions to their finances. In these earliest of stages there is a middle-ground, legally-speaking, that you can work with so that your parents still have autonomy but you can rest easy knowing that should something happen you will be informed in time to mitigate the damage. My firm can work with you to provide your family with financial safeguards. Elderly care, especially when it comes to financial management, is a very important part of my practice area. I routinely work with families to create a Power of Attorney so that children can assume care of their elderly parent, or even to provide this decision making tool to a spouse, sibling or adult child who is better able to handle the financial obligations. Call me today if you are at that point where you need to begin to help make decisions for a parent, or if you are beginning to see a need to plan ahead for your own financial future. I can walk you through all of the options available to you to protect you or your loved one’s finances in the days ahead. A basic last will and testament cannot accomplish every goal of estate planning; in fact, it often cannot even accomplish the most common goals. This fact often surprises people who are going through the estate planning process for the first time. In addition to a last will and testament, there are other important planning tools which are necessary to ensure your estate planning wishes are honored. Do you have a pension plan, 401(k), life insurance, a bank account with a pay-on-death directive, or investments in transfer-on-death (TOD) form? When you established each of these accounts, you designated at least one beneficiary of the account in the event of your death. You cannot use your will to change or override the beneficiary designations of such accounts. Instead, you must change them directly with the bank or company that holds the account. Do you have a child or other beneficiary with special needs? Leaving money directly to a beneficiary who has long-term special medical needs may threaten his or her ability to qualify for government benefits and may also create an unnecessary tax burden. A simple vehicle called a special needs trust is a more effective way to care for an adult child with special needs after your death. Do you want to place conditions on some of your bequests? If you want your children or other beneficiaries to receive an inheritance only if they meet or continually meet certain prerequisites, you must utilize a trust, either one established during your lifetime (living trust) or one created through instructions provided in a will (testamentary trust). Do you expect your estate to owe estate taxes? A basic will cannot help you lower the estate tax burden on your assets after death. If you think your estate will be liable to pay taxes, you can take steps during your lifetime to minimize that burden on your beneficiaries. Certain trusts operate to minimize estate taxes, and you may choose to make some gifts during your lifetime for tax-related reasons. Do you own a house with someone “in joint tenancy”? “Joint tenancy” is the most common form of house ownership with a spouse. This form of ownership is also known as “joint tenancy with right of survivorship,” “tenancy in the entirety,” or “community property with right of survivorship.” When you die, your ownership share in the house passes directly to your spouse (or the other co-owner). A provision in your will bequeathing your ownership share to a third party will not have any effect.